There are some people whose work, when it appears, makes you say to yourself that now you can die happy. Megan Whalen Turner is absolutely one of those people for me; seventeen years after I first devoured The Queen of Attolia (2000), the second book in her Queen’s Thief series, I’m still just as in love with—and even more impressed by—the series and her achievements. 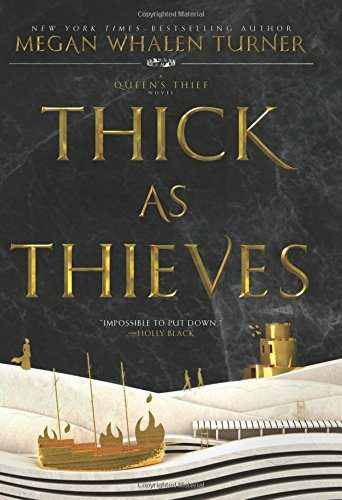 I would say that now that I’ve read Thick as Thieves (2017), I can die happy, except that word on Twitter is that the sixth book in the series is hard on its heels. We can only hope. While I’m agnostic on the question of spoilers generally, one of the marvels of Turner’s writing is the fact that she blatantly uses POV against the reader, tricking you into thinking you know more or less than you do and never giving away a single iota of information more than she has to. Let me be clear: though the novelty of the books’ reveals is necessarily a thing that can only happen once, the books hold up on reading (and rereading), not only for the clockwork precision of Turner’s clever writing but above and beyond that for the sheer delight of the characters, the world, and the prose. The books are best read without any spoilers whatsoever. I mean it; don’t even read the jacket copy if you can help it, as it gives things away in every case. The first, The Thief (1996), is told from the point of view of Gen, a young thief sprung from prison by the magus of the country of Sounis, who wants Gen to steal a legendary object for him so that it can be used to unite Sounis with its neighboring country of Eddis. The Queen of Attolia follows the Thief of Eddis as his country goes to war with Attolia, the neighbor of Sounis and Eddis that is ruled by a queen who is the Thief’s personal enemy. In The King of Attolia (2006), Costis, a young member of the King’s Guard, is swept up into the train of the new king of Attolia after his marriage to the queen, while A Conspiracy of Kings (2010) follows the exploits of Sophos, another member of Gen and the magus’s party in The Thief, as Sounis descends into civil war. Thick as Thieves crosses the middle sea to the land of the Medes, the continental empire determined to swallow the countries of Eddis, Attolia, and Sounis whole and follows Kamet, the slave-secretary to a high-ranking member of the Mede court last seen in the second book. The Thief, a Newbery Honor book, largely predates the creation of YA as a category, with the result that it was marketed by default as middle grade; YA was almost a thing by the time The Queen of Attolia appeared, but the series wasn’t treated as a unit until the publication of The King of Attolia and A Conspiracy of Kings. The appearance of this fifth book, twenty years after the series began, has provided an excuse to put the whole series in front of a new generation of YA readers, with new covers, new bonus material, and new blurbs from today’s giants of YA front and center. Despite the updated marketing, the books are still outliers in the genre in some ways: each volume shifts viewpoints and narrators, ranging from first person to omniscient third, and each book is studded with inset retellings of stories and, in the case of Thick as Thieves, poetry. The myths and the poetry are a key part of what makes the world feel completely believable; for those like me with a background in the classical world, they’re also a delight, as the differences Turner introduces between her world and the ancient (but also early modern/late medieval) Near East on which it’s based are part of the charm. To take just one example, in Turner’s equivalent of the Greek pantheon it’s the fire goddess Hephestia who rules supreme over her fellow gods, after enlisting her brother the thief god to steal the lightning bolts from her father. Other differences are equally large: though many elements of ancient religion are recognizable, guns, pocket watches, and printing are commonplace, and the societies of Eddis, Attolia, and Sounis, and the Mede Empire, are an interesting blend of ancient and early modern as well. The differences between the continent and the “Little Peninsula” the three countries occupy come to a head in Thick as Thieves, which eventually finds Kamet walking across a good chunk of the Mede Empire in the company of a very large and competent Attolian, whose identity is obvious to the reader but which Kamet tries not to think about. Kamet was the chief slave of the brother of the heir to the empire, and his perspective on Attolia and everyone associated with it is tolerantly condescending: in his eyes, they are all hardly better than barbarians and “for the most part uneducated,” meaning that their education is in subjects other than Mede culture (p. 47). The Attolian, meanwhile, considers the Medes the real barbarians because their society is still a slave economy. Yet he and Kamet agree that the Medes thus live in fear of their slaves, however much they might deny it. Asked Ennikar of Immakuk what have you learned? The famous friendship and love between the two legendary heroes is something of a commentary on Kamet and the Attolian, both of whom are not fully honest with one another. Although “two supporting characters hike across the countryside” might sound like an odd plot for the newest book in a series in which the fate of nations hangs in the balance, Turner provides enough tension, both internal and external, to demonstrate that the stakes are high, even if they’re not quite as self-evident as in the previous book. It’s clear by the time the journey ends that the main plot has continued to move, even if some key characters are only seen in brief glimpses in Thick as Thieves, or are not seen at all. Moreover, given that Kamet and the Attolian are not monarchs, spending time with them is in some ways a refreshing change of pace. Kamet spends most of the journey considering liberty and trying to decide what he wants with it, but he is in the end only one man, with no burdens imposed on him other than those he imposes on himself. Both he and his Attolian companion are thus in some ways much more independent than Eugenides, Attolia, Eddis and Sounis, whose very names are titles marking their responsibilities. Getting Kamet and the Attolian’s outside perspective on the more august characters is also rewarding, as the contrast between how other people perceive them versus the way they narrate themselves is telling, and has changed over the course of the series. If Thick as Thieves marks a change of pace, it’s partly because the previous books have dealt with complex subject matter, albeit with an extremely light and deft touch that is characteristic of Turner’s writing. The Queen of Attolia more or less opens with a character losing a hand, and the book becomes an examination of trauma, recovery, and the nature and limits of love even as it is also a political thriller. The King of Attolia is another political book, this time told through the perspective of King’s Guard Costis, whose political imagination is limited until a chance encounter with the new king of Attolia changes his life forever. The theme of political education continues in a much darker key in A Conspiracy of Kings, as the heir to the throne of Sounis wrestles with the obligations his birth has imposed on him and whether he really wants to retake his throne. Ending his country’s civil war is easier said than done, and by the end Sounis faces a very stark choice about what it means to be a king and what kind of king he wants to be. He is also forced to reckon with his own limits and the limits of his friends: there are some Gordian knots that even Eugenides’ genius cannot solve, only cut. In some ways The Thief—which is fundamentally a heist novel with the rulership of Eddis hanging in the balance—is the lightest of the series, though even that book features more face-to-face encounters with gods than the protagonists would like. The divinities in Thick as Thieves aren’t quite so obvious, although they’re definitely present. Turner’s prose in particular is an interesting point of comparison between the Queen’s Thief series and another that frequently comes up in the same conversation, Dorothy Dunnett’s Lymond Chronicles (1961-75). Though she wrote historical rather than genre novels, Dunnett’s influence on science fiction and fantasy is pervasive, and the points of congruence between the two series are fascinating: both follow the life and career of a remarkable young man and his equally remarkable friends, enemies, and relations in an early modern world of nations jockeying for power through both open and covert conflict. Both Lymond and Eugenides—and Sounis, Attolia, and Eddis—are forced to reckon many times with the costs and limits of power and to weigh their own personal desires against their duties as leaders. Both Dunnett and Turner are unafraid to make things complicated, and to acknowledge the complexity of human and political relationships. But whereas Dunnett’s prose is marked by a kind of greased-lightning maximalism, Turner’s is precise and limpid, almost minimalist. If Dunnett’s writing is a landslide, Turner’s is the hand-cut retaining wall at Delphi that has stood for more than two thousand six hundred years. Kamet is told that his journey will take him farther than he imagines, while the Attolian receives instructions to “Remember Immakuk. Pay the fastener” (p. 143). Working out just what the messages meant—and deciding which of the people the duo meet along the way might have been more than mortal—is one of the pleasures of rereading, and not just reading, the books. Much as Kamet’s sense of superiority is shaken by the end of the novel, the assumptions the reader makes going into the book affect one’s perception of how its eventual revelations shake out. Altogether, Thick as Thieves expands the world of the Queen’s Thief into a new continent even as it fills in and hones previously introduced characters. Though it’s difficult to recommend the book as the way to start this series, it is a worthy entry and a compelling read in its own right, as well as in the series overall. Wherever the next volume goes, and whoever the narrator is, I will be happily rereading this newest entry until it arrives. Electra Pritchett is a lapsed historian who splits her time between reading, research, and her obsession with birds and parfait. Born in New Jersey, she has lived on three continents and her studies have ranged from ancient Rome to modern Japan. She blogs at electrapritchett.wordpress.com.